Christy has an Associate degree in Applied Science: Veterinary Technician from Baker College (2012), and is a Licensed Veterinary Technician. She has worked in the veterinary health care field since 2007. In 2016, Christy graduated from the Karen Pryor Academy Professional Dog Training Program (KPA CTP) and provides positive reinforcement dog training and behavior services through her own company, K9 Pawsitive Enrichment Training, LLC. She is also working towards earning a veterinary technician specialty in behavior. Christy's compassion and knowledge of animal behavior shows through her patients. "When I have a stressed or fearful animal, I do everything I can to reduce their fear and anxiety while they are staying in the hospital or receiving treatments." 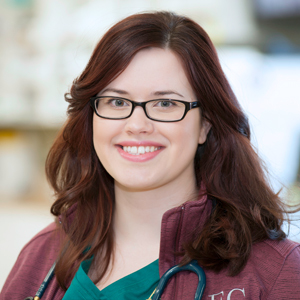 Christy chose her career because she wants to make animal's lives better: "I want to improve the quality of an animal�s life through both their health and happiness, which is why I love both veterinary medicine and animal behavior/training. I like knowing that I am keeping my patients as healthy, happy, and comfortable as I possibly can. I also enjoy the variety of animals I get to work with at AEC." Christy has a Cavalier King Charles Spaniel, Armani, who is 10 years old and the love of her life! She also has a 7 year old Sheltie/Shepherd mix, Katie, who has taught her a lot about training and anxiety/reactivity in animals. Most of Christy's clients have reactive dogs and through Katie she became inspired to search for ways to help rehabilitate these animals using positive reinforcement training methods. Christy also has a rabbit, 2 guinea pigs, and a cat. All of Christy's animals are rescued pets!